In trying to fit all known ZetaTalk together on a chart, showing where the planets are at various dates, there is a conflict. The Zetas say that the Point of Passage will have Planet X and Earth forming a triangle with the Sun, but this triangle puts Planet X inside the orbit of Venus. 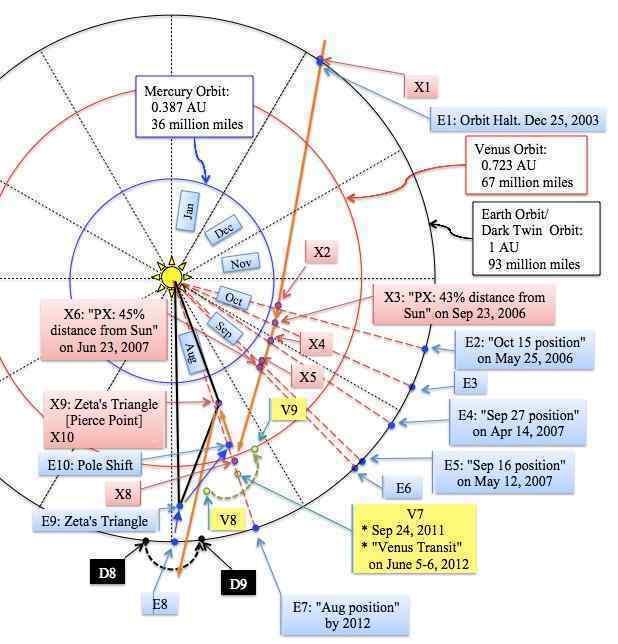 Yet in the most recent ZetaTalk on December 1, 2012 the Zetas said that Planet X would proceed outside the orbit of Venus at some point before the passage. Can you explain? Does Planet X continue to take a straight path outbound from the Sun, pushing the Earth about during this process? At present, there is a virtual standoff, with 3 planets in front of Planet X - Earth, the Dark Twin, and Venus. The Dark Twin and Venus are not expected to escape this squeeze until the Last Weeks, but as Planet X comes closer, the magnetic clash between the Earth and Planet X intensifies. This is always assumed to be a drama for the Earth, though we have dropped hints along the way that some of this drama affects Planet X. We have stated that Planet X comes close, then retreats, then comes close again as the Last Weeks approach. Planet X continues in its straight line path, creating a more violent wobble in the Earth and appearing more visible in the skies, also squeezing Venus toward the Earth to loom large, as Planet X will be coming outside the orbit of Venus at that time and press the Earth far to the left of the August location. Planet X is close enough to the Ecliptic that it suddenly flips into opposition, pointing its N Pole to the South and its S Pole upward, drawn closer in toward the Sun. Here it is in position to form the ZetaTalk Triangle, though the Earth has not yet been drawn toward Planet X. During the jump in toward the Sun for the second 270° roll, Planet X has given the crowded planets around Earth a chance to escape. The Dark Twin, which has fallen behind the Earth, moves forward in their shared orbit. Venus is almost thrown forward in her orbit by the Repulsion Force, having been pushed too close to the Earth during the squeeze. The Earth now has fewer barriers between herself and Planet X, and is drawn closer by magnetic attraction. She travels 30 million miles closer to Planet X. Rotation slowing to a stop occurs. Planet X continues its outbound path, and finding the distance from the Sun allowing it to begin to form a side-by-side alignment again, starts to pull its N Pole up and this is the process that causes the Pole Shift for Earth, grabbing the S Pole of Earth and jerking it upwards by 90°.